I went along tonight to hear Julian Assange’s speech wondering just slightly if he might not astonish the world, and announce his exit into the arms of the police. 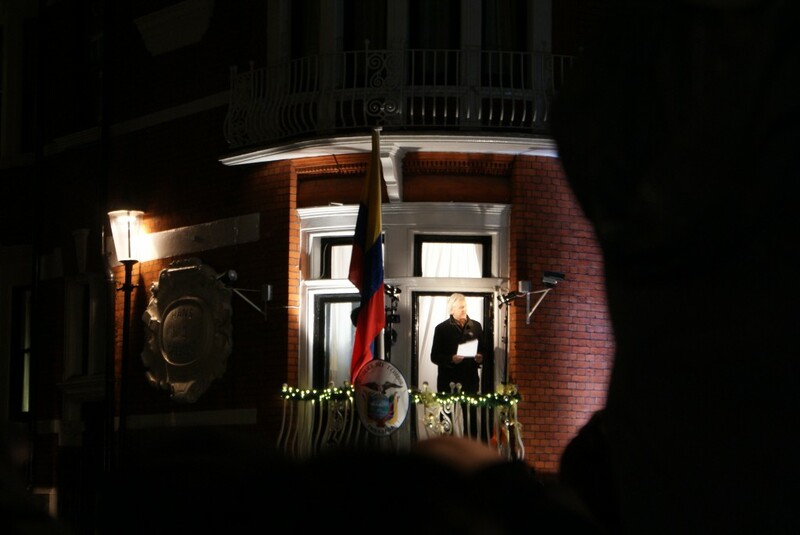 Anything, as we’ve learned, can happen with Assange, and time, and the wearing patience of the Ecuadorian government must I think force his hand one day. But his speech tonight was not so dramatic. He spoke to roughly fifty of his own supporters, I’d say, dozens of journalists and camera operators, and another few dozen policemen, plus a few tourists and passers by. In total, at a rough guess, I think there must have been a couple of hundred people. He said nothing really new, though his defiant tone will hearten his supporters. He denounced America for investigating him and Australia for failing to support him, and praised Ecuador for making clear its principles were “not for sale”. He promised Wikileaks would release documents in 2013 affecting “every country in this world”, and referred his bid for election to the Australian Senate. He said he was staying put; but he also said his door was open for anyone who wanted to talk to him. You can hear the speech on mainstream media websites of course. But here it is as it actually sounded in Hans Crescent, taxis, hecklers, foreign journalists and all. It sounds chaotic at first but gets better after about a minute, when the sound of demonstrators and broadcasters dies down. So. Go talk to him. Door is open, right? I may well suggest it! no, not door open rise..